Well I hope you all enjoyed that long weekend because for me personally, it was exactly what I needed! School ended on Friday, new job started on Saturday. I think I slept for 12 hours straight Saturday night.. it was wonderful. Thanks to everyone who supported our little shop this weekend, all packages are shipping today! We spent some time on the beach, relaxing and mentally recharging.. then I busted out the sewing. and he's the godfather to one of them! Whew, those puff quilts are a ton of work and I tend to forget that when I make promises to people that ask for them... Anyway, last one this week and also my Pillow Talk Swap Pillow needs to get done! Here's my sneak peek..
Alright, back to the grind.. see ya soon! 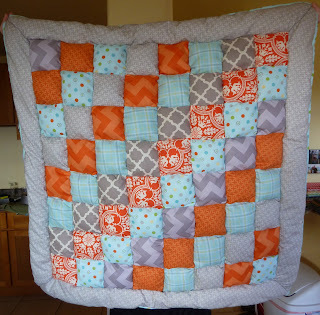 I love the orange and blue puff quilt. They are both so cute! Wow. Lots of transition for you - still! Glad those puff quilts are almost done and realllly like your cross blocks! Sometimes I feel tired when I read your blog. ;) I don't know how you get it all done honestly! The puff quilts are fun, and like Debbie I reeaaaaaally like those cross blocks. They're make a great pillow. The puff quilts are so cute and look so cozy :D! The pillow is going to look great. I really like the low volume background! I just love those little pluses. What's your new job?